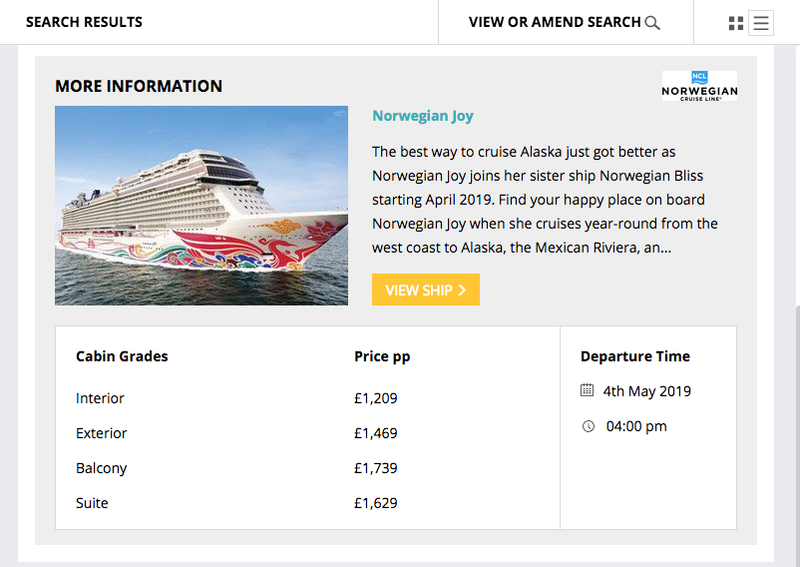 As part of ongoing development there have been new features released on our Cruise Search Widget; including new cruise line integrations and changes to the Widget itself, which we hope will make it more user-friendly, and easier to find the cruises that you’re looking for. In our last batch of new features we focused on improving the search experience so that results could be more relevant. This time around, most of the new features affect how results are shown and used. MSC & NCL now live! Since our last update, we have completed full integrations with both MSC and Norwegian Cruise Line, and are now able to provide full pricing, availability and itineraries for around 4,000 cruises just for those two lines alone. If resort cruises aren’t your thing, we also have new integrations with Star Clippers, Voyages to Antiquity and SeaDream Yacht Club. Furthermore, we have unlocked capabilities to include river cruises in the Cruise Search. Currently, the fully integrated lines are: Viking River Cruises, CroisiEurope, Crystal Cruises, AmaWaterways and Fred. Olsen River Cruises, with more coming over September and October. Until now, the pricing available for each cruise has been for every type of cabin, and while this can be useful, when looking at cruises for big resort ships from Royal Caribbean, Norwegian Cruise Lines or others, the amount of data is difficult to understand as they have so many different options. From now on, the standard pricing list will show base prices for inside, outside, balcony and suite accommodation options, rather than list them all unless you specifically choose this option. As we’re seeing more and more customers from outside the UK wanting to take a Cruise Search, we have added the option to remove pricing completely. Until we have the functionality to add in different currency types (planned for 2019), showing prices in GBP is not always wanted and can now be removed. The ‘Enquire Now’ button on the search results can now be hidden, can send an email to a designated address or be forwarded to a URL. Just gone live, Instant Holidays have their own Cruise Search and Brochure Rack on Facebook. Still in beta testing, we’re running a soft launch of a new feature, called Smart Linking. We’re really excited about this upgrade as it will enable every single search, every cruise and all the ships to have their own unique URL within the Widget. Designed to help you share the right content, you’ll be able to email a customer with their search results, send a link to an exact ship or cruise, and use the content from the Cruise Search in your email marketing campaigns, on social media and anywhere else you want to promote something specific. Smart Linking will be available as an upgrade to those who want it, and if you can’t wait, you can help us test it on the button below.